Because you’re starting to cook more than just chorizo and eggs these days. Because you love this dish. Because you loved it the first time I ever made it. Because you did the most important part — roasting it — that one time. Because I know you can make it too. 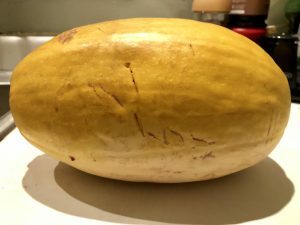 2 cups roasted spaghetti squash. Roasting details below. 2 tsp thyme leaves, fresh if you can find them, if dry, 1 tsp should be good. 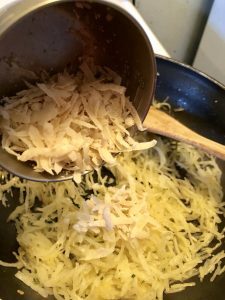 1/4 cup grated parmesan. 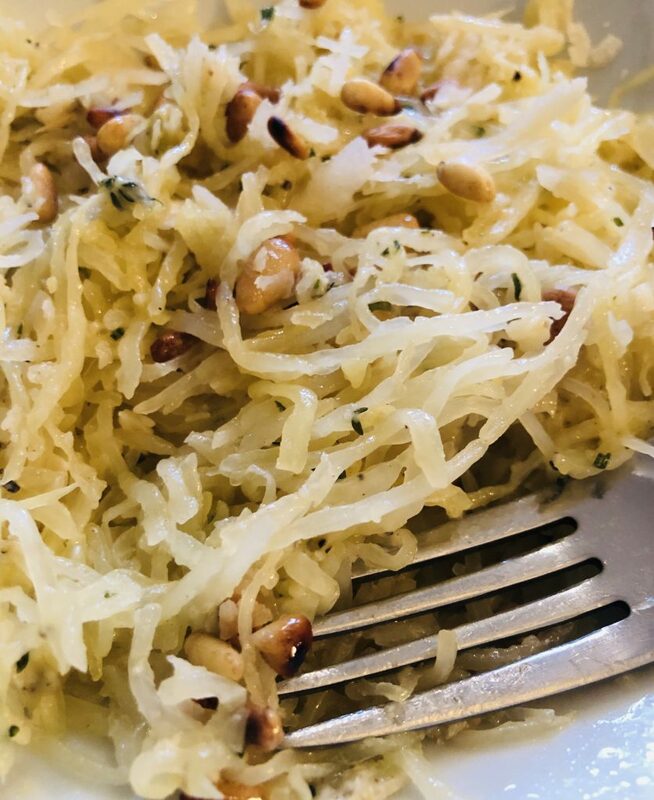 Don’t use the pre-grated stuff, it’s never as flavorful. But if you don’t have a grater for the parmesan, well… what are you going to do? 1/2 lemon. You only need its juice but I don’t traffic in the bottled stuff. 2 tsp pine nuts, roasted. You can roast these in a skillet on a stovetop on medium-high temp for 5-7 minutes, but watch closely, as they burn quick! You can also roast them in an oven, on a baking sheet, at 375°F, 5 to 10 minutes. Again, they will burn quick, so keep an eye (and nose) out. 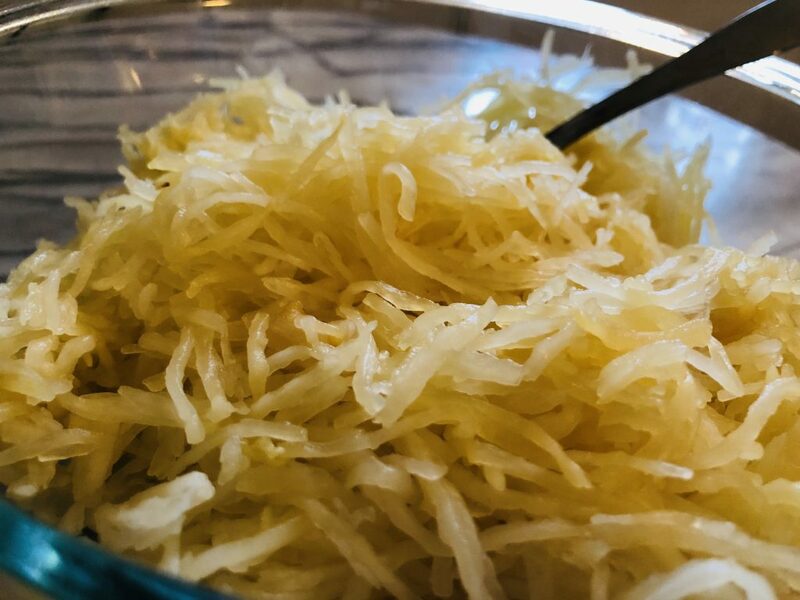 Buy a spaghetti squash of any size, as long as you get two cups of spaghetti strands after roasting, which means a smallest one will work. If you can only find a large one though, buy it! You can do lots of things with it, including double or triple this recipe. Roast the squash. You need at least 45 minutes for this, so it’s best to do it when you have some time on your hands, like when you’re grading papers, say.You’ll see recipes online to cut it up, oil it, etc. etc. Ignore them! Make little slashes in the flesh of the whole squash, all around. Put it on a baking sheet or some foil and turn the over to 400°F, for about 45-60 minutes, depending on the size. Check its doneness by gently pressing it — with an oven mitt or cloth, not your bare hand! If it’s soft, it’s done! Don’t over-roast; you’ll have mush, not spaghetti strands. Take it out of the oven, and let it sit for at least ten minutes, as it will be very hot. This might be a good time to roast your nuts (couldn’t resist, #sorrynotsorry) and gather the rest of your ingredients. 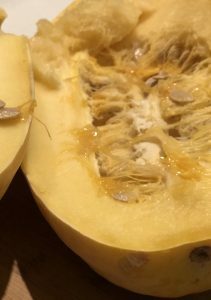 When the squash is cool enough to handle, cut it in half, length-wise. It should be easy to cut; if not, it’s not done yet. Scoop out the seeds. This is the most labor-intensive part, because the strands have trapped the seeds and won’t let them go without a fight. 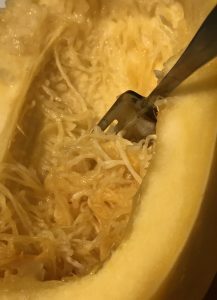 It’s not hard though, you’re much much stronger than spaghetti squash. Fun part next! With a fork, working from one end to the other, scrape the flesh to release strands of spaghetti, until you’re left with only the skin. Heat a s killet on medium heat, and addthe two tablespoons of olive oil to it. 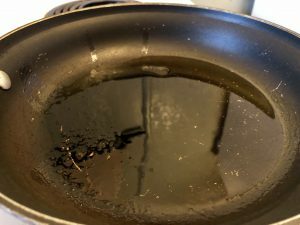 Once the oil is hot, it will shimmer. Immediately add the garlic, and move it around on the pan, so it doesn’t burn. 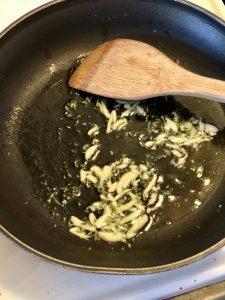 About a minute in, the garlic will start to gain color, a very light brown, turn the heat down, burned garlic is bitter! Add the herbs, and toss them around the pan. 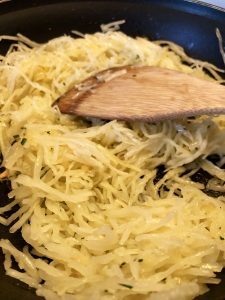 Add the two cups of spaghetti squash strands, and again, stir them in the pan, so that the herbs and garlic get all-mixed-up in the squash. Keep the heat on medium or medium-low, and cover the squash, for about five minutes, stirring it a few times. Meanwhile, grate your parmesan cheese. Then, with the heat on low, add almost all the cheese (save about a tablespoon) to the squash, stir. Taste it, and add salt and pepper. This is an instance where I salt after I add the cheese because parmesan, like the best of us, is salty. Now, turn off the heat,squeeze the lemon juice all over the squash, and stir so that the juice mingles with everything else. Taste, and adjust salt/pepper if you like. Plate your food, garnish with the remaining cheese, and the pine nuts. If you don’t have time to roast the squash, the interwebs claims you can microwave it but I’ve never done that. 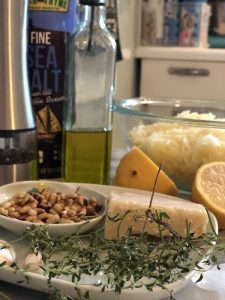 Pine nuts are a bit pricey, but they really make this dish, and you only need two teaspoons. You could also try walnut pieces. If you don’t have the herbs, don’t sweat it, this dish is good without them too!